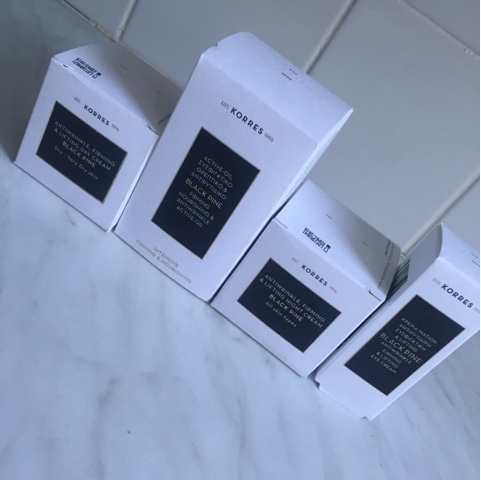 Anyone who reads my blogs will know my long standing love affair with korres, it’s a brand I was introduced to a few years ago in my early blogging career and I can honestly say I have never been disappointed with a product I’ve had the pleasure of trying. You can see my first review of korres here, be kind it was in my early review and I have learnt a lot since then. 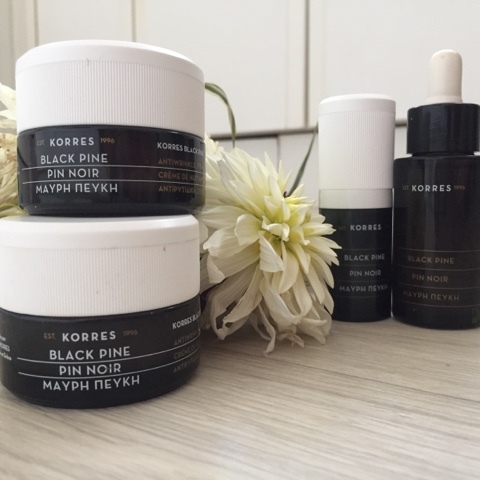 So today I present you the Korres Black Pine Collection consists of 5 items, I have been super lucky to have the opportunity to try 4 items of the collections. 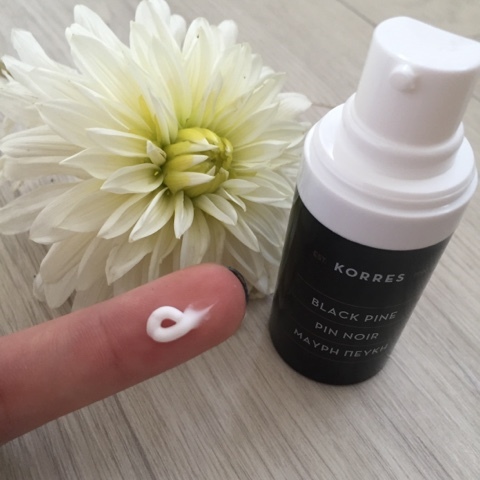 The Black Pine collection contains 97.7% natural content and Korres as a company is offers a natural and certified organic range in all areas of beauty and skincare. The collection itself has 5 products to wow you and the collection is aimed at firming and lifting the skin, and as I'm over 30 this is perfect for my age group. Lines are something I do worry about, I have noticed that they are becoming more of a permeant resident on my face rather than ones you just get after a late night. The packaging first off is classic and chic, the boxes are ascetically pleasing and the bottles inside are very simple and look great on the shelf. Now the important part it’s not all about how a product looks it’s about how it performs. You could have the greatest packaging in the world but of the product doesn't perform the packaging means nothing. I have taken my time trying and reviewing this collection and ensured that I have used it correctly as directed both day and night and I am honestly so impressed in the results. This was what I was advised by someone who is trained in Botox & fillers. So to be honest I was not expecting a huge difference on my forehead. I have been using the collection for 10+ days now and the results have even surprised myself. I do it the same time every time I use it and keep it by my bed so I won’t forget. · Cleanse my face and neck. · Mask once a week as well as exfoliate (generally I exfoliate and do my mask on the same day often a Sunday). 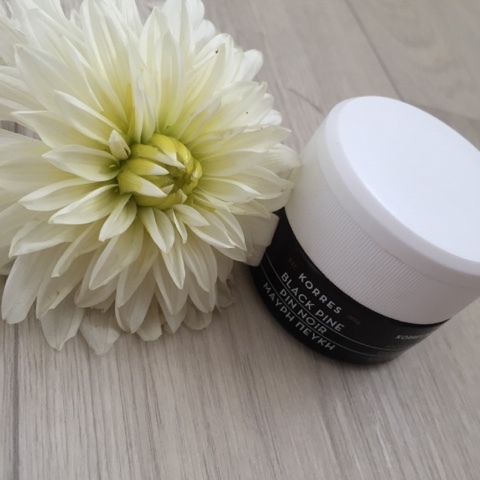 · Korres Antiwrinkle, firming & lifting eye cream. 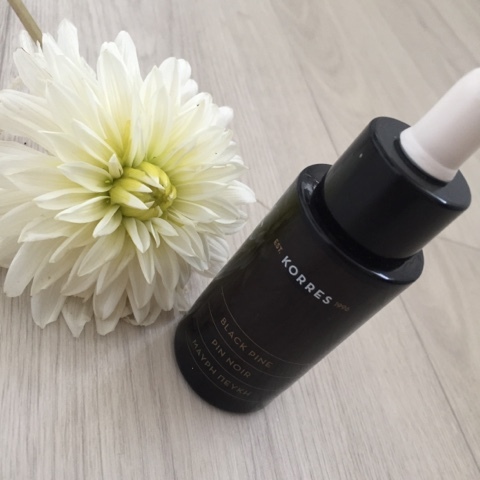 · Korres Firming, Nourishing & Antiwrinkle Active Oil. · Antiwrinkle, firming & lifting Day Cream or Night cream time dependant. I would say if you’re going to commit to a routine then find a brand that works for you and use the whole brand (unfortunately I don't have the pleasure of completing the routine with the Korres Cleanser, toner, mask and exfoliator) but with the results from using half in my routine I can only imagine how amazing my skin will feel if I had the complete set. The eye cream is the first I apply, you only need the smallest amount and always use your ring finger to apply, apply to both under the eye and above lid and just under the eyebrow. It’s a light to medium consistency and glides onto the skin smoothly. Has a light aroma which is pleasant as well. It takes roughly 1-3 minutes to fully soak into the skin, not greasy although does leave a slight tacky feeling. Advanced firming cream to instantly lift and gradually reduce deep wrinkles, puffiness and dark circles. Second I apply the serum, although I do apply it all over my face and neck I concentrate and apply it first to problem areas. Now problem areas will be different for each and every person. 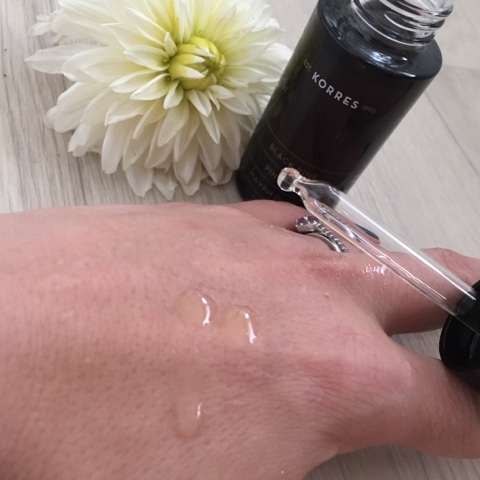 Personally my problem areas that this serum will do its best work are my smile lines around my mouth, in-between my eye brows and my forehead, where I have already mentioned I have permanent static lines. 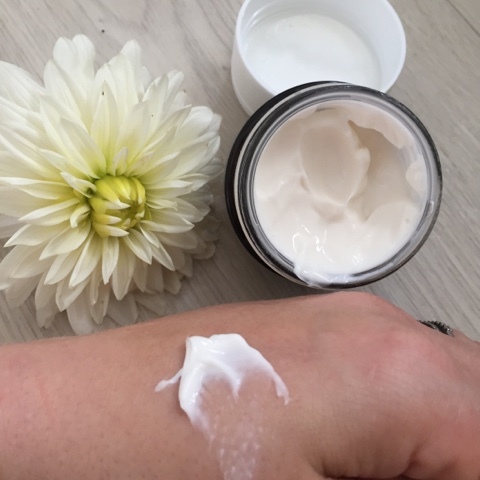 Then I finish off with the cream, I have both day and night and the reason you use a different cream for day and night is because the night cream is usually heavier. 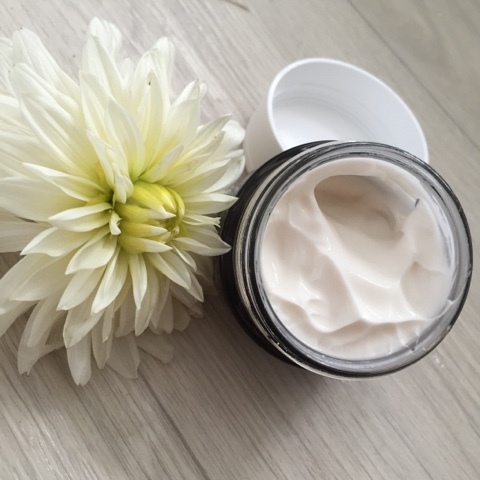 Your skin goes through hell during the day (sun, wind, ran, dirt, pollution etc..) so once you have removed all the dirt from your daily cleansing routine and done the above steps the night cream is richer and has more in it to replenish your skin. 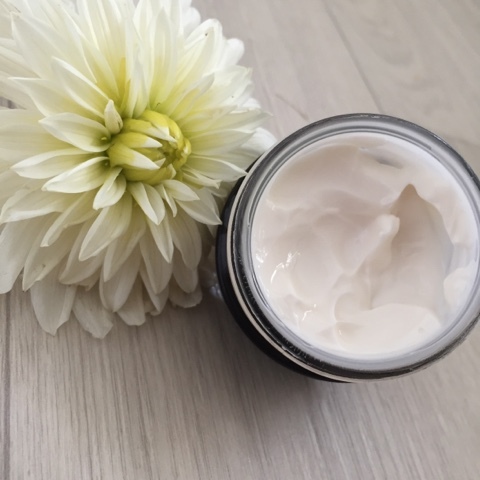 The day cream is lighter this is because even though you’re going to do your morning facial routine and it will have had the added benefit of all the goodness from the night cream allowing it to soak in. 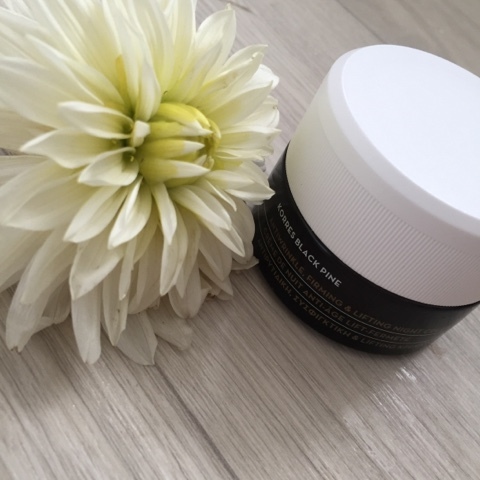 The day cream is an added protection and to re moisturise the face once it is cleaned, this will help keep the daily damage to a minimum, it is also a lighter fragrance than the night cream. Skin is left feeling soft and not greasy. It comes in Dry to Very dry (which is what I had to trial) and Normal to combination. I would imagine the normal to combination cream is lighter so not to leave the skin with any shine or thick feeling. 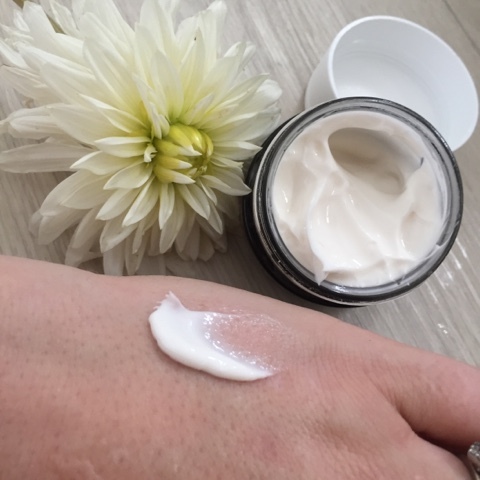 Remember when applying face cream avoid the eye area as it is so delicate, this is also why you apply the eye cream with the ring finger as it has the lightest touch. This collection is fantastic and the changes to my skin in the time I have been using it has exceeded my expectations. As you can see from the image my static lines have drastically improved, I feel better about myself and my makeup sits better on my face and doesn't slip into the static lines. For me the results speak for themselves, I whole heartedly love this collection it delivers exactly what it promises, and this for me means it is worth every penny. Your skin is an investment and it’s never too early to take care of your skin. Have anyone of my lovely readers had a chance to use this collection or this brand? I would love to hear your thoughts about it and how you got on with it. 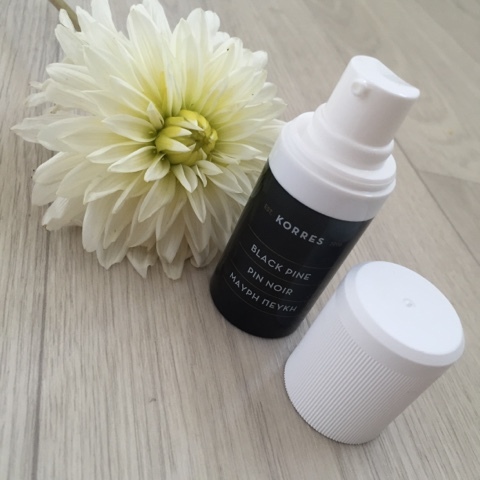 Please feel free to check out some of my previous Korres reviews Their lipstick, Lip Butters & wild rose moisturiser. 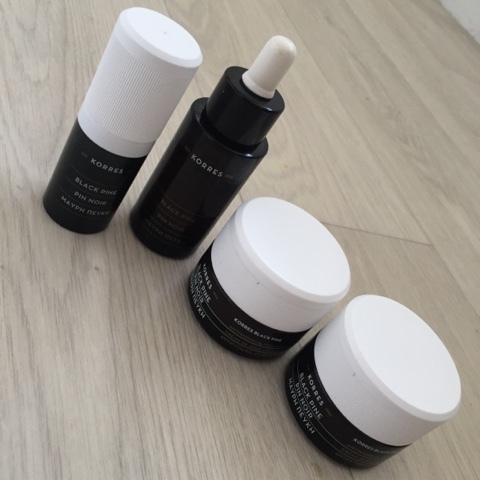 I love Korres products from B-Glowing! I typically use their body butter but now I want to try this!